Do not try to hassle with securing your tarp to a canopy frame using your own rope or some other method. PTM ball bungee ties are the only way to go. You can choose from 6-inch, 9-inch, or 11-inch sizes. Plus they come in black, tan, red and white and all the colors have stripes. Since all PTM tarps have grommets every 18 or 26 inches, the bungees are the ideal size. 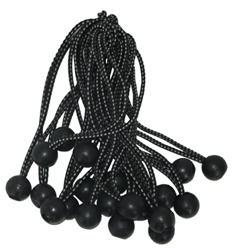 The ball bungee is inserted through a grommet hole and then wrapped around the canopy frame and looped over the ball to form a ponytail.